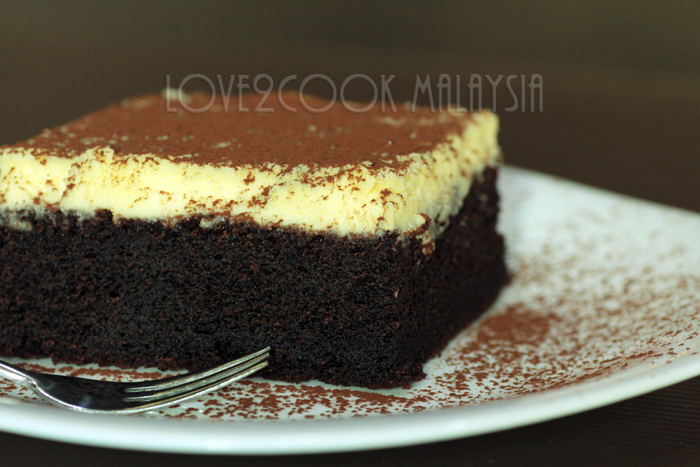 ♥ LOVE2COOK MALAYSIA♥: Moisty Chocolate & Cheese Cake..
Moisty Chocolate & Cheese Cake..
Friends, what do you do when you followed a recipe 100% (cook/ bake) but still end up with negative result? Who do you blame, the recipe? The recipe owner? Or yourself? Will you just blame yourself and will try the recipe again with some alteration or maybe the same? To be frank, I tried and tested uncountable recipes from the net and cookbooks this far. When some turned out a huge hit, some went straight into the bin! Not a single time I have accused the recipe nor the recipe owner although I'm frustrated because the recipe didn't work too well on me. I would make the dish again and again using the same recipe with minor adjustments here and there...until it suits our taste buds. Gotto tell you that I'm still a novice baker. And I don't mind cooking or baking the same recipes ( if I'm really interested ), atleast until am satisfied. Enough said! Here's for you .....Chocolate & Cheese Cake. I did not scratch my head much to prepare the chocolate cake as I just used the most hit chocolate cake among my kids...recipe posted HERE before. Firstly, prepare the base, ie. the chocolate cake. Add evaporated milk and flour mixture gradually, continue beating using low speed until done and fully incorporated. Scrape the sides with a cake spatula. Pour the batter over the half-baked chocolate cake. Bake for another 40-45 minutes at 150C. The cake is done when the top is firm to touch. Cool the cake on a wire rack and refrigerate for atleast 3 hours before slicing. I chilled the cake for just 2 hours! Thus, a not so perfect look...need more patience! The cake tastes even better the next day! This is simply gorgeous! Yummy beyond words! Sis I'm drooling here...can I drop by and have a piece? Looks delicious. Your recipes not turn out right? hard to believe. All thoese I have tried so far are great. Dear, i will definitely not blame you, because i tried all your recipes with great success. Today i just tried your chicken masala, eventhough i made little alteration but the major of the recipe is come from you, my family gave thumbs up to this recipe. 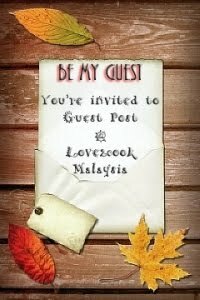 Thanks dear for your kind sharing. 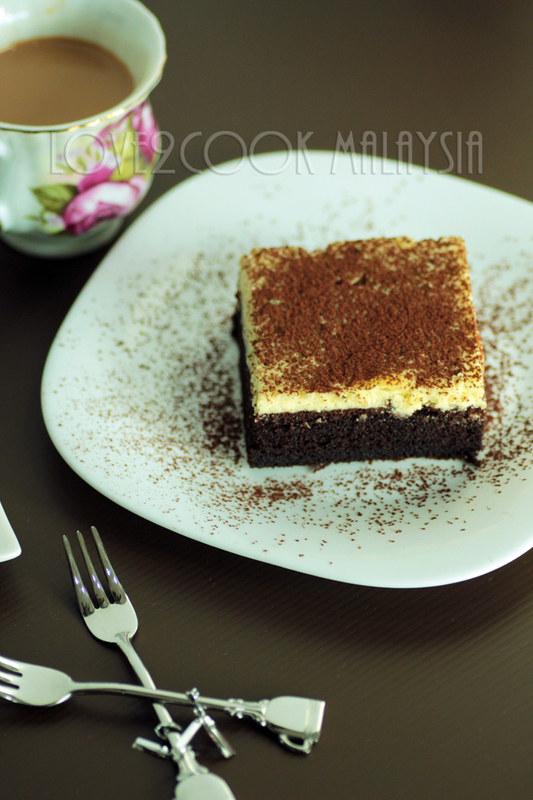 This chocolate and cheese cake look so tempting too. Your site is very wonderful and share very affective information. Looks absolutely delicious! I would so love to try some. I am sure it tastes great! As for me, whenever a recipe does not work, I would not blame the book or author, rather on what steps I did wrong, sometimes the ingredients and weather can affect the overall success of the recipe. And like you say, everyone's taste bud is not the same! OMMGGG..x tahan akak tgk love!! 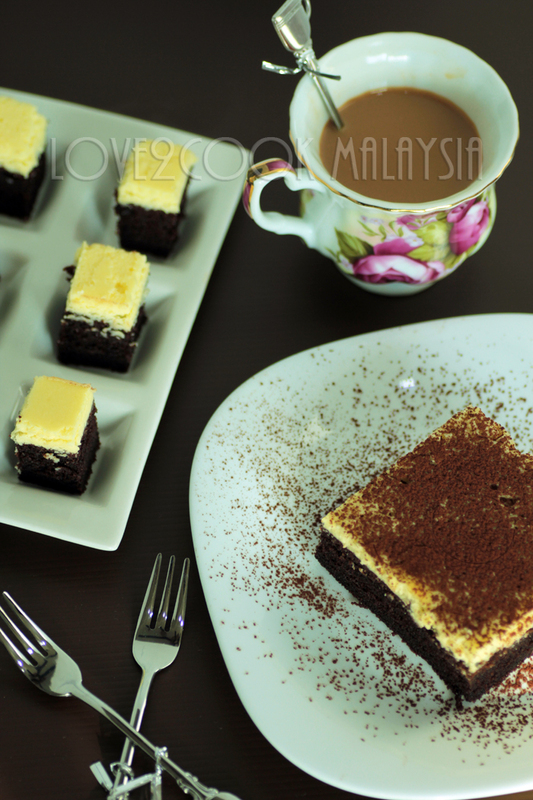 looks so delicious & marvellous..drooling dah ni! Oh my, what a lovely cake! I really like the idea of the simple cream cheese frosting too! I love cheese cake. Dusting very impressive and very good clicks too. Mindblowing and super irresistible cheese cake. These chocolate cheesecake squares look fantastic! 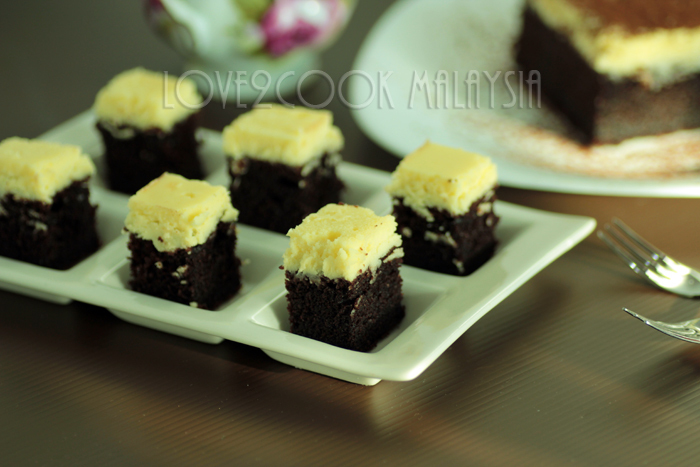 Love..ur cake is sumthing that i cant say 'no' to...it is sooo tempting..chocolate and cheese..perfect combination...tapi sekarang bulan posa..tak sempat nak baking a cake..will keep this recipe to try for hari raya...mesti this cake will go in a blink..i bet! Hi Love, this cake is perfect and gorgeous, I love it. It look really good and to die for kind. P/S I'm back to blogging. yum!!!! I love how you use the cream cheese as frosting- it looks so pretty! I bet it lifts the chocolate cake up to another level! Thanks for your recipes. Would like to know what you spread on the cake in the picture. It looks nice? Mam, thank you soooo very much... Been looking for the recipe for quite sometime... And wallaaa... Thanks again! hi just tried this cake really delicious. but wanna know after baking for 15 min the center of the cake still soft and eventually falls in when i spread the cream cheese. thus the cream cheese mixed in the cake batter. is there something i did wrong ? pls help as my children really like this cake. Hello Connie, apologize for my late reply. As I know oven temp may vary. You may need to bake your cake longer before adding the cheese mixture. When adding the cheese mixture, pour it gently as the cake underneath would be still hot. I really hope this helps. Please let me know how it went.